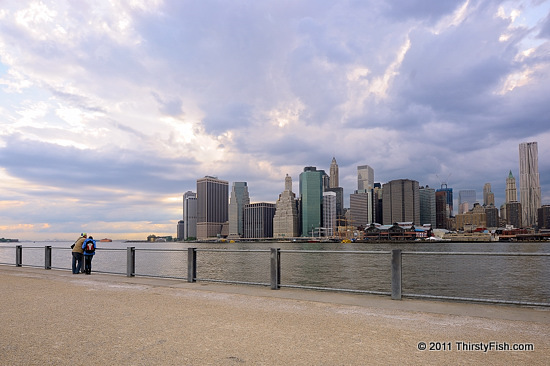 This is a view of Lower Manhattan from the newly constructed and recently opened Pier 1 section of the Brooklyn Bridge Park. The sky dominates The City! Human progress has always been dependent upon our ability to tame nature. We prevail by first understanding what we encounter, and then coming up with ways to harvest this knowledge in a meaningful, functional way. Sometimes seemingly random knowledge manifests itself as practical many years after its discovery. Boolean Algebra which was developed by George Boole in 1854 only became useful when it was applied to circuit design almost a century later. Today, all our computers and cell phones use Boole's logic system. Although our history so far has been that of conquering or taming what we have encountered, we continue to be vulnerable to things which we don't know exist, things which we still do not or can not understand, things which we have not yet tamed or things which might never tame. The Sky is just too overwhelming.